I have used this for 2 years now. It is the best I have come across by far. Stays on chain and after a clean pop this on and its like new. I apply every 2 weeks but in winter and depending on weather I apply every week. Great stuff. Works well & not too messy. The attacable spray tube is in the can lid but is very short. Could do with a normal 6inch tube to help spraying the inside of the chain. Other than that great. Hmm not sure on this, definitely not as fling proof as other reviews. It was all over my bike after a ride. Going on its a very thin liquid, I was expecting it to become sticky and thicker as it dries like my normal Castrol lube I use but it hasn't. It becomes a little sticky but after 2 rides my chain feels dry to me and when touching with my finger its only a little tacky. I'm relatively new to this so don't know if its supposed to be this way?? Other than that comes with a handy little straw and good pressure which makes spraying it on easier. I have used other brands before, but since XCP I have not used any others. It does the job and it does it well. Great chain lube, no fling and very weather resistant. I'd definitely buy more. Far less fling than other products I've used. Makes cleaning easier and chain seems to run smoother. Good clean product with little fling and seems to keep the chain clean. Very clean and easy to use. Don't need to apply a lot to cover all the chain and there is minimal fling which is always good. Chain runs quiet & smooth, lube does not fling & appears to repel dirt. Buy this stuff! Great item, good fast delivery, well pleased. After taking the trouble to clean the chain thoroughly (XCP Universal Parts Cleaner recommended) you want a lubricant that will work to maintain the chain. Apply XCP Chain Lubricant sparingly and evenly to the clean chain, and ensure that excess liquid is wiped off. Ideally the chain will also be warm. Due to the excellent penetration and flow properties of XCP Chain Lubricant, be aware that a little goes a long way. Over applying will only lubricate your garage floor! Rotate the wheel to assist flow and penetration into links and sprockets. For best results leave overnight before use. Due to the non-sticky nature of XPC Chain Lubricant you will find that cleaning the chain will get much easier as time goes on. 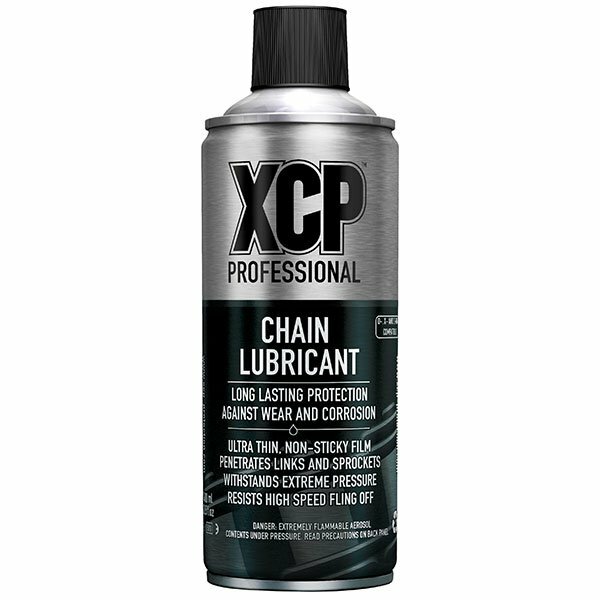 Unlike other chain lubes, XCP Chain Lubricant dries to a non-sticky film that will not attract and retain dirt to the same extent as other lubes do. Keep using XCP Chain Lubricant and you will find chain cleaning will become much easier when maintenance time comes around. Is this suitable for O, X and Z ring chains? Yes, this is suitable for O, X and Z ring chains.